Since receiving payments for products and services is a key goal for every business, it is vital to organize this process properly. Therefore, we’d like to draw your attention to the Payment Restrictions module by Amasty. The extension lets you create various payment method rules and flexible payment conditions for certain products or even customers. Having installed the tool, you can restrict payment methods based on shipping address, store view, customer group, or various product attributes, which substantially improves the productivity of your payment process and multiplies business opportunities, as well as decreases risks. Now, let’s describe Amasty Payment Restrictions in more detail. The first thing we’d like to mention is a set of flexible restriction settings. Thus, the extension offers everything for creating flexible payment rules with various options. As an example, we can name the ability to restrict specific payment methods for customers from specified countries. As for trusted buyers, it is possible to provide them with unique additional options. For instance, you can allow bank transfer for the wholesale customers. Consequently, by fine-tuning your payment system, you will maximize its productivity. The extension allows you to use product attributes as a basis for payment methods restrictions, so you can easily disable particular methods for cheap items or even products of specific materials. The same is about customer groups. As mentioned above, you can restrict some customer segments, as well as create privileged ones. Provide certain customers with such additional payment options as ‘cash on delivery’ or ‘check/money order’ and disable offline payments for not logged in visitors – both are possible with Amasty Payment Restrictions for Magento 2 and 1. As for limitations based on shipping, the module lets you utilize various shipping parameters (from country to zip code) as the basis for your new restriction. Consequently, you will no longer dissatisfy your buyers with the ‘cash on delivery’ method that doesn’t work in their region but is visible among available payment methods. Furthermore, Amasty Payment Restrictions offers an excellent opportunity to restrict payment methods on certain days and time, so that you can easily turn off next day delivery for weekends or other days when your store doesn’t work. Moreover, to make your restrictions even more precise, the extension enables you to use customer attributes as a basis of payment rules. Thus, it is possible to specify conditions for individual buyers via shipping address, customer group, date of registration, gender, and more. It is also possible to apply restrictions to all products, backorders, or non-backorders. 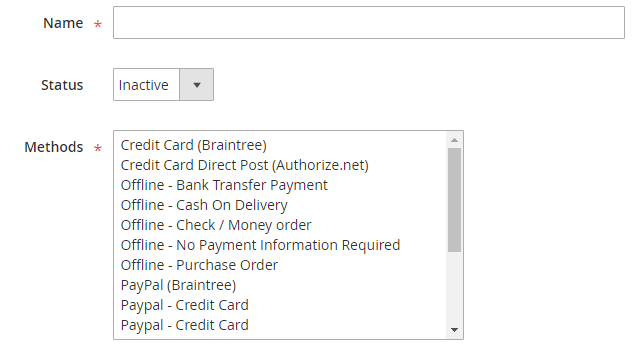 Another useful feature of Amasty Payment Restrictions is represented by the ability to set restrictions for the admin panel so that you will eliminate the cases when your managers apply payment methods that can’t be used for particular customers or situations. 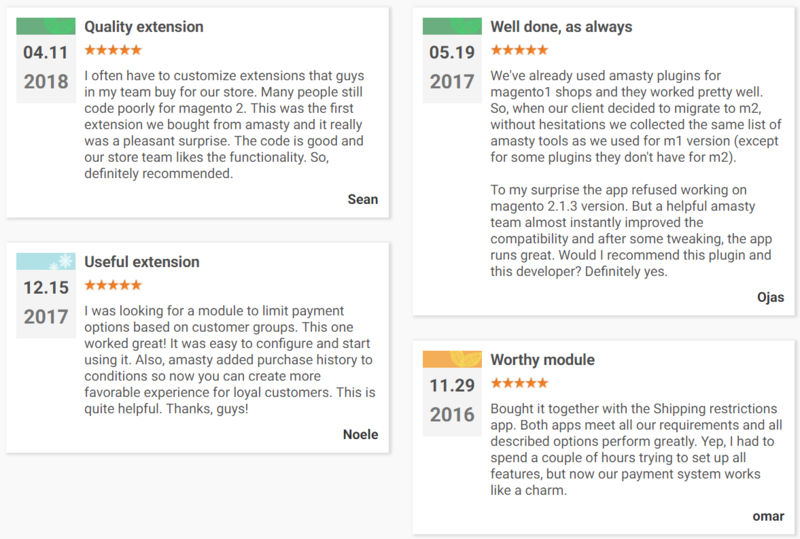 If you run several websites in different countries or for different customer groups, Amasty Payment Restrictions for Magento 2 and 1 allows you to use a store view to restrict payment methods. Now, when you know core features of the extension, let’s see how it works from the perspective of admin users. Action (you can duplicate and customize each rule). When adding a new rule, you will have to work with five tabs of settings: Restrictions, Stores & Customer Groups, Days & Time, Conditions, and Coupons. In Restrictions, you should specify a rule name, status, and methods you are going to restrict. In Stores & Customer Groups, you decide whether to apply the rule in the admin area, as well as choose stores and customer groups. 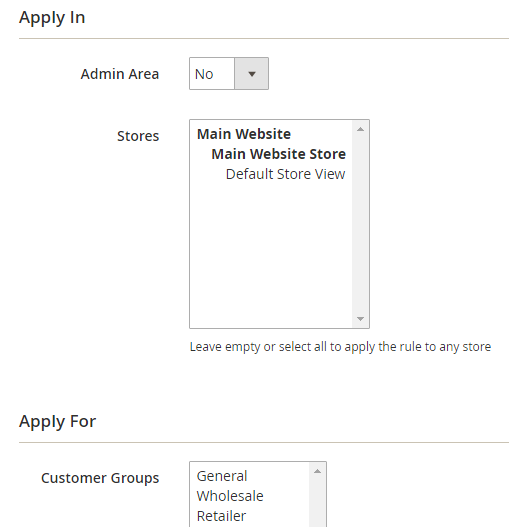 For both settings, you can select all options or leave fields empty to apply the rule to any customer group and store. 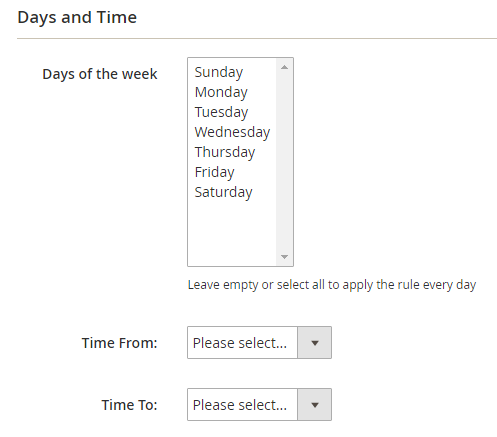 In Days & Time, you select days of the week and a specific time interval for the rule to be applied. In Conditions, you can make your rule more precise. The rule will be utilized only if the specified conditions are met. Besides, you can choose orders to which the rule will be applied: all orders, backorders, or non-backorders. In the Coupons tab, you can specify coupon codes with which the rule will be activated or stopped. In the same way, you can select a shopping cart rule from available options (after you create them in the appropriate section of the Magento Admin) which will trigger applying or not applying a restriction rule with all coupons included in the specified discount rule. As for the Magento 2 Payment Restrictions extension’s configuration, here you can enable/disable including tax and discount in subtotal. Advanced Conditions were implemented in the module. 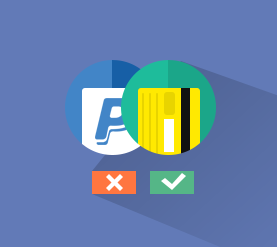 PayPal Express was added to available payment methods. Customer attributes and Purchase History were added to the rule’s conditions. Now you can set the subtotal to include taxes and discounts. As you can see, Amasty Payment Restrictions for Magento 2 and 1 offers a set of flexible options that let you create payment restrictions according to even the most demanding ecommerce requirements. The extension can be used in combination with Shipping Restrictions for better productivity. As for the price of the module, it is $199 for the Magento 2 version and $99 for the Magento 1 tool.